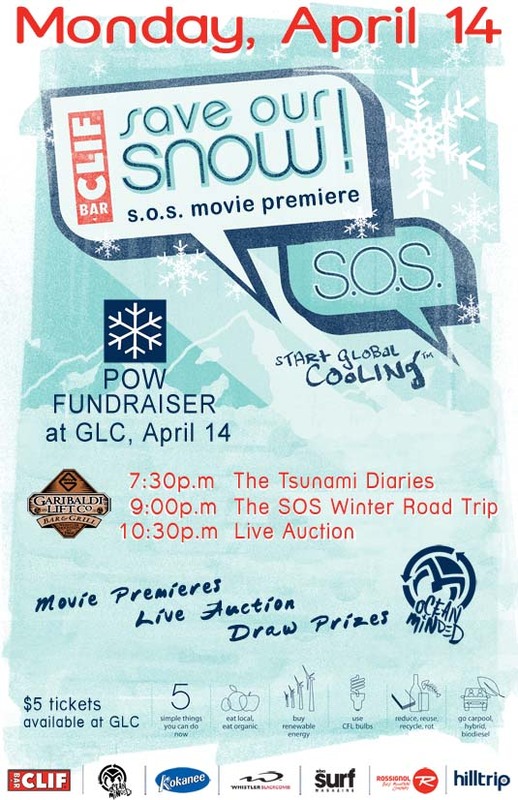 In an effort to raise awareness about global warming and take action towards change, Hilltrip hosted the first Protect Our Winters (POW) Fundraiser in Canada at GLC on Monday April 14th. Featuring CLIF BAR S.O.S Winter Road Trip documentary and a live auction, the event raised $1,000 for POW's advocacy and renewable energy projects that reduce carbon dioxide emissions in the atmosphere. POW is a non-for-profit, founded in 2007 by pro snowboarder Jeremy Jones, whose mission is to build a united front of winter sports enthusiasts in an effort to restore our winter climates. Featuring 2 movie premieres, a live auction and draw prizes, the event was a success; everyone present had a good time and learned a thing or two from either the Save Our Snow (SOS) documentary from Clif Bar or the presence of Timmy Turner, pro-surfer and Executive Producer of the Tsunami Diaries, Second Thoughts and his forthcoming Cold Thoughts, who was there to introduce his documentary, answer a few questions and convey an inspiring message of someone facing adversity and making a positive difference in this world. Throughout the evening, there will also be a live auction with including a framed picture 24x16 of “Icewall”, from photographer Brian Hockenstein who was voted best photo at the latest Out of Bound exhibit, art prints from Chili Thom, art pieces from Daniel Poisson and a Whistler Blackcomb Spring Edge Card among other unique and rare items, as well as a raffle where people will be invited to spin the Kokanee prize wheel to win goodies from Clif Bar, Ocean Minded, Whistler Blackcomb and Kokanee. During the evening Marie Fortin took the opportunity to mention a few facts about global warming in the hope of inspiring everyone to be part of the solution. “Scientists are saying we need to cut our global warming pollution by at least 80% by 2050. We are already hearing things, such as the carbon tax or pay parking being put in place in Whistler to mitigate the effect of global warming. This is a small price to pay to avoid the worst cases scenarios where adaptation to global warming will cost us way more if we keep on doing business as usual. A report by the former Vice-President of the World Bank, suggests that global warming could shrink the global economy by 20%. Taking action now would cost just 1% of global gross domestic product. According to scientists, we are past the prevention stage with climate change, and have been for decades. The problem is that is doesn’t look and feel like a survival crisis right now and, by the time it does, it will be too late to do anything about it. This is why scientist and economist are urging politicians to take action and this is why organizations such as Clif Bar, Ocean Minded, Kokanee, Wistler Blackcomb, Rossignol, SBC Surf, Hilltrip present this POW Fundraiser. 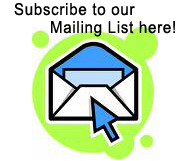 A good place to learn about how you can shred you carbon footprint can be found at Protect Our Winters here. One of the tips found there is to ‘purchase carbon offset credits and help neutralize carbon emissions’ and this is exactly what Hilltrip did to offset the CO2 emissions produced for Timmy’s to come to Whistler; it purchased $22 worth of Cool-Tags and kept an estimated 3,300 pounds of carbon dioxide out of the air. The S.O.S. Winter Road Trip is a seven-week adventure highlighting some of the simple things we can ALL do to fight Global Warming. Small acts that collectively harbor the incredible power to bring positive change -- from swapping out a light bulb to eating organic foods. In February 2007, a fearless duo of eco-minded snowboarders embarked on the S.O.S Tour to visits Western US mountain towns and resorts ‘almost’ all the way to Whistler traveling in a vegetable oil powered RV (a.k.a. 'Soy George'); carving out some time to ski and board along the way (on the little snow they have). Mike 'whatever it takes' Parziale and pro-boarder Luke Mathison lead the charge, supported by a cast of fellow shredders, including world champion freeskier and career environmentalist, Alison Gannett. All of this in hopes of inspiring others to join in the effort to Save Our Snow.